I’m in an unfamiliar city, painfully hungover and damn near broke. Tony Iommi gazes down at me, some 30 feet tall. His image has been projected above the stage for what seems like an eternity. But, the message is clear: we are to look upon the face of God. Al Cisneros and proselyte Jason Roeder walk out to deafening applause. They say nothing, offer nothing. They merely stand. Suddenly, Matt Pike tromps across the stage. He paces like an animal, the warlord already coming alive in him. Al and Chris remain still. If Iommi be God, then this is the Second Coming. However, cryptic posts across social media channels placed the band in the studio at various times over the last year or so. What could one really make of that, though? Who would have actually guessed that the famously tectonically-paced Sleep would go ahead and drop a surprise album on everyone’s heads? Well, after something like 15 years, we have finally arrived at the Riff Filled Land. As sudden and unexpected as any revelation, heralded by the most auspicious date of April 20th, here it is: Sleep’s THE SCIENCES. THE SCIENCES opens with a title-track that, musically speaking, consists of little more than Matt running his guitar through a gauntlet of fuzzed-out tonal shifts (it’s also, as others have noted, a bit reminiscent of “FX” off Black Sabbath’s VOL. 4). To the uninitiated, this may seem like just three minutes of noise, and it is certain to piss off those impertinent enough to demand new music or “actual songs” from a band, but it serves a very specific purpose: to prepare the listener for liftoff. Indeed, a certain ear could rightly interpret Matt’s toggling as the setting of a ship’s controls in preparation for launch. And how this record takes off. “Marijuanaut’s Theme” opens on, what else, a bong rip, before exploding into a riff heavier than a dying star. Al and Matt pull their strings with the force of several Gs, hurtling the song headlong into its trajectory as Jason fills the void around them with cymbal rides that shimmer past like meteor showers. As the song continues and the riffs begin to cascade over one another, becoming denser and denser, approaching supernova, Matt throws on the afterburner, ripping into a solo that sends the Marijuanaut to even greater heights. Even with all of the Sleep clones that have popped up in the last decade or so, it’s been a long time since I’ve heard something as monstrous as this. Maybe part of Sleep’s return was to remind us how it’s done. Riffs are the highest form of currency in the metal world, and I’d be a damned liar if I said that the one in “Marijuanaut’s Theme” didn’t immediately land in my top 10 list. It just crushes. But it’s not like Sleep isn’t known for their Earth-shattering riffs. What is maybe more noteworthy here is Jason’s drumming. 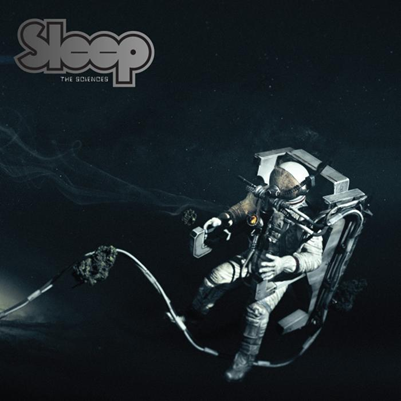 When I first saw Sleep after they had reformed with him, he seemed to play with a certain amount of trepidation, perhaps not yet having fully translated his drumming style over from that of Neurosis’. But he seems to have finally found his proper footing with Sleep, and it is a thing to behold. Rather than simply adding more volume, Jason brings a dimension of technicality and sense of equipoise to the band, giving new life to the older tracks that have found their way onto THE SCIENCES. Next up is “Sonic Titan,” one of said older songs with a title properly capturing the essence of the band if there ever was one. Originally released as a live bonus track on 2003’s DOPESMOKER, the band’s last full-length, “Sonic Titan” is as colossal as the name might suggest. It takes a full five minutes for the band to fully rev up, picking up momentum before Al intones a whole four lines of vocals—and then it’s back to business. Jason glissades across hit kit, creating a sound which seems to orbit the band as Al bobs and weaves around Matt’s trademark wailing. The band ventures into almost bluesy territory before they bring it back together to hammer out another rampager that sees the track barrel inexorably towards its conclusion like a sonic avalanche. And yet, once again, the song itself isn’t necessarily as significant as what can be extrapolated from it. Buried deep beneath the stacks of blown Orange amps Sleep has left scattered across the landscape over the years are the bones of a much earlier incarnation of the band. Now, those bones have been dug up and dusted off, offering clues to the band’s evolution. The original, live version of “Sonic Titan” is almost bootleg in quality, not bad, per se, but hard to make out any real notes or chord progressions through all the distortion and feedback, and hardly speaking to the power the band has amassed since then. But here, now, in the full glory of a band at the height of its studio capabilities, we can fully appreciate it and its legacy. Apparent in the first 20 seconds or so of “Sonic Titan” is something very close to “Cyclopian Scape” off High on Fire’s 2009 album DEATH IS THIS COMMUNION. That Matt Pike may have drawn directly from his early work with Sleep (“Sonic Titan” was most likely written way back in ‘95) to fuel High on Fire’s breakneck conquest of the metal world does not speak to a lack of creativity or originality on his part, but rather to the fact that he was already way ahead of the curve that early in his career. It’s preposterous enough that Matt stands as rightful heir to both Iommi and Lemmy. The idea that it may be possible to delineate the last couple decades of metal from what are more or less early Sleep outtakes the way it is possible to do so with Black Sabbath is mind-blowing. But look, I don’t want to get too pedantic and end up spoiling all the magic of this album for those who haven’t heard it yet. Suffice it to say that ancient civilizations the world over believed that Gods imparted them with sacred knowledge. And, across history, certain peoples were entrusted with safeguarding those secrets. Wise men gave us astronomy and medicine. Holy men gave us mathematics. Sleep have given us THE SCIENCES. Praise Sleep.